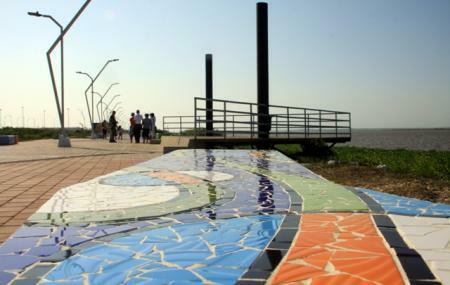 The Malecon Leon Caridi is a beautiful walkway built right adjacent to the river Magdalena. The walkway is about 80mts wide and 700mts long running parallel to the river. It’s a nice calm place for a stroll early in the morning or during sunset. The breeze is strong and refreshing and the place has a serene vibe to it. The spot is also famous with a lot of cyclists and tourists. Ask locals for direction. Drive or take a cab if possible. Love this? Explore the entire list of places to visit in Barranquilla before you plan your trip. Fancy a good night's sleep after a tiring day? Check out where to stay in Barranquilla and book an accommodation of your choice. How popular is Malecon Leon Caridi? People normally club together Bocas De Cenizas and Paseo De Bolivar while planning their visit to Malecon Leon Caridi. The road is kinda broken.. however, this is a good place to chill. Nice coconut water pretty affordable (US$ 1). Nice place to enjoy part of the Magdalena river views, however it is not very well maintained. Strong winds make it a little hard to stay near the edge of the water, but it has a great view. The road is not very long, though.